Whenever we go up to the cabin for more than a few hours, Gordon comes up with a project. I think it’s because if he sits still for too long without making something he gets antsy. 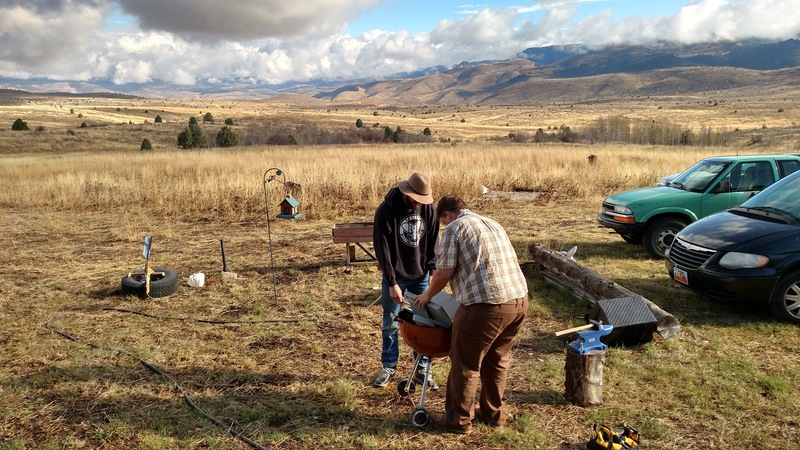 This past weekend, the project was a DIY blacksmith forge and a couple simple projects. We hadn’t ever done any blacksmith work to speak of, but we had spent some time watching historical reenactors do it. So between that and YouTube videos, we felt pretty confident we could manage to make some things without maiming ourselves. 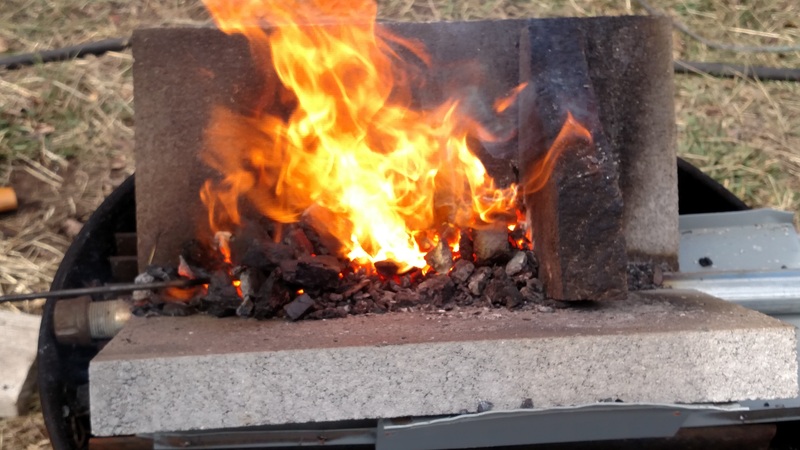 Gordon brought some metal, pipes, concrete slabs, and coal to the cabin to make the forge itself. He used a battery-powered vacuum as a bellows, which worked beautifully. After starting a small fire and getting some nice coals, he and a friend fired up the vacuum and got to work. I was amazed at how effective the setup was (Don’t tell Gordon. As far as he knows I never doubted him for a second). With the air flow through the adjustable holes in the pipe on the bottom it was easy to heat the metal up quickly and effectively. After that it was a simple matter of whacking it with a hammer on an anvil until it was the shape he wanted. 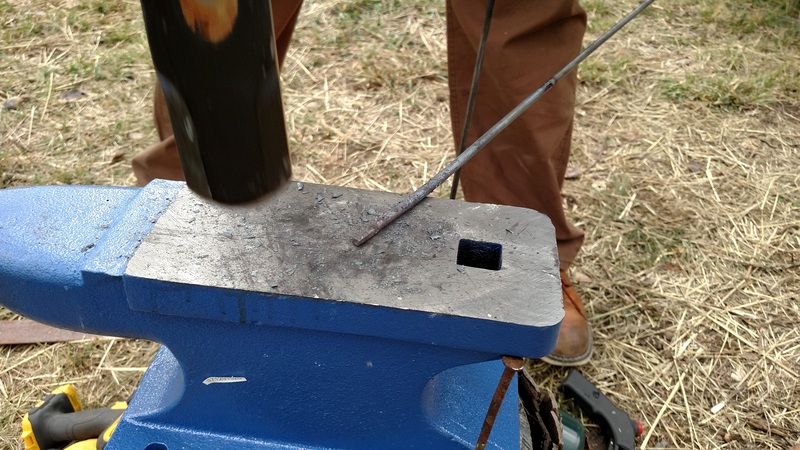 This forge led to hours of fun last weekend. We had a few different groups of friends and neighbors up and everyone took a turn doing some heating and hammering (some with more success than others). At the end of the weekend we just took the forge apart and loaded it into the back of the truck to take home until next time. Portable was definitely the way to go. 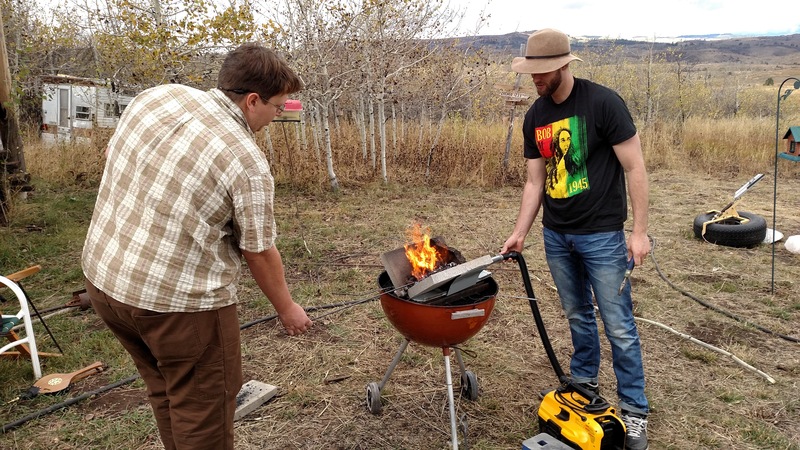 Check out this post about the dutch oven stand we made using the forge.